Rabbi Adin Even-Israel Steinsaltz’s Reference Guide to the Talmud is the original Talmud study aid. 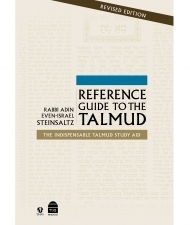 An indispensable resource for students of all levels, this fully revised, English-language edition of the Reference Guide clearly and concisely explains the Talmud’s fundamental structure, concepts, terminology, assumptions, and inner logic; provides essential historical and biographical information; and includes appendixes, a key to abbreviations, and a comprehensive index. For improved usability, this completely updated volume has a number of new features: topical organization instead of by Hebrew alphabet, re-edited and revised text to coordinate with the language used in the Koren Talmud Bavli, an index of Hebrew terms to enable one seeking a Hebrew term to locate the relevant entry. An excellent companion for anyone studying any edition of the Talmud.